The capability of UV-visible light to probe metallic nanoobjects through plasmon excitations at length scales well below the optical wavelength is a driving force of the ongoing development of nanoplasmonics. One of the challenges is to characterize wetting phenomena at nanometric scale through those collective resonances. Some researchers of INSP, in collaboration with the Norwegian University of Science and Technology, have developed an analysis methodology which allows recovering directly the dielectric response of particles deposited on a solid substrate in terms of damped oscillators. Combined with dielectric modelling, its application to metallic nanoparticles supported on various oxide surfaces allowed demonstrating the universality of geometric polarization modes in those nanoojects and better understanding their nature. The plasmonic response of Ag, Au and Zn nanoparticles supported on oxide substrates, having either a large band gap (Al2O3(0001)) or a semi-conductor behavior (ZnO(0001), TiO2(110)) has been probed by differential reflectivity spectroscopy during metal evaporation. A new specific experimental setup with a simultaneous acquisition capability in s and p polarization at a time scale of a few tens of milliseconds allowed the analysis of the intrinsic optical properties of nanoobjects thin films. Those are defined by two dielectric thicknesses or interfacial susceptibilities along the directions parallel and perpendicular to the surface. The idea was to obtain them by numerically inverting the equations giving the reflection coefficients with the help of the Kramers-Kronig relation between their real and imaginary parts. The advantage of the approach is to get rid of the optical contribution of the substrate in the differential signal and to disentangle the dielectric behaviors along the two directions of space. The methodology was tested on simulated spectra before its application to experimental cases and its soundness checked a posteriori through sum rules. For all the experimentally studied systems, the different plasmonic contributions have been brought out by decomposing the interfacial susceptibilities in a finite sum of damped harmonic oscillators (Figure 1). Dielectric simulations based on truncated sphere or spheroid shape allow assigning the various experimental bands to eigenmodes of charge polarization. Those modes of geometric nature are found for all the studied metals and substrates. Although the bulk Drude behaviors of Ag, Au and Zn are quite similar, the analysis demonstrated the pivotal role of interband transitions in the structuring of the optical spectra and the visibility of the eigenmodes. Silver and gold, the two metals of plamonics, give rise to resonant modes characteristic of a free electron behavior. 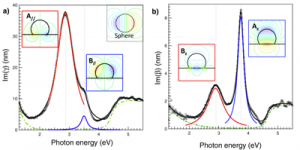 Surprisingly, the zinc nanoparticles develop a sizeable polarization mode on bound electrons. The evolution of oscillator parameters allowed analyzing in a simple way the tendency towards equilibrium of objects, the particle aspect ratio, the effects of polydispersity, interface damping and distinguishing between growth and coalescence regimes. Beyond the study of plasmon modes, the determination of interfacial susceptibilities shed light, for semi-conductor substrates, on deposit induced gap features. Those have been assigned to band bending due to charge transfer between the metal and the oxide. Dielectric thickness (or interfacial susceptibilities) parallel (Fig. a) or perpendicular (Fig. b) to the substrate surface. Those quantities have been extracted from experimental differential reflectivity spectra for Ag deposit on alumina. Next to interband transitions (green lines), the decomposition in harmonic oscillator (read and blue lines) show 4 main polarization modes called A//, B//, Az, Bz for particles closed to the truncated sphere equilibrium shape. The equipotential lines highlight the polarization charges which are quite different from those of the full sphere in vacuum (inset Fig. a). The introduced methodology facilitate the reading of the optical response of supported nanoparticles whatever the metal and the substrate. One of the perspectives is its use in the study of growth mode, of the metal/semi-conductor interface formation and of adsorbates.